Last month, the Alabama State Port Authority announced major funding grants for a planned automobile-handling terminal. It now has a deal with a partner that will develop and operate it. According to information released April 18 by the port authority, its representatives signed a memorandum of understanding April 17 in Buenos Aires, Argentina, with AutoMobile International Terminal. The company is described as a joint venture between Terminal Zarate S.A. and SAAM Puertos S.A.
Buenos Aires-based Terminal Zarate provides several port services. It describes its auto-handling facility on the Parana River northwest of the Argentinian capital as being among the largest such terminals in the Americas, handling more than 600,000 vehicles in 2017. 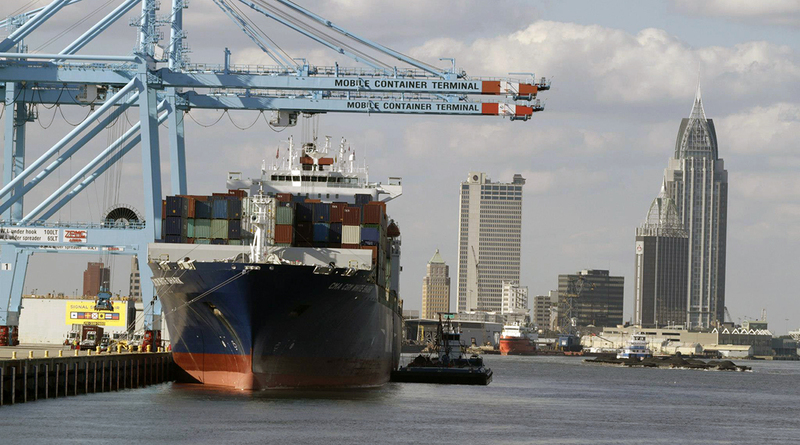 Bloomberg News describes SAAM Puertos as a Chile-based company whose operations include construction, development and operation of ports and various port services. The company says its shipping network includes 11 ports in six countries including Mexico and the United States. “This agreement represents a key step in diversifying the port authority’s business while providing a strategic asset to regional automotive shippers,” said Jimmy Lyons, CEO of ASPA. The planned facility is a type of terminal called “roll on-roll off” or RO/RO, meaning that it allows passenger cars and other vehicles to be driven on and off ships. Lyons has suggested it could be attractive to automobile importers but also could be used to export cars and trucks made in Alabama. He had speculated that Mercedes-Benz, for example, might use it to ship vehicles to South America. “We look forward to work together with Terminal Zarate and the Alabama State Port Authority and bring all our knowledge and experience to the service of the terminal, and consolidate our position in America,” said Yurik Diaz, manager of SAAM Puertos S.A. According to ASPA, the RO/RO terminal will occupy about 57 acres on the site of a defunct bulk-material handling facility. It will cost about $60 million to build; two federal grants announced last month total more than $41.5 million. ASPA expects construction to start in late 2018 and be complete in late 2019. The announcement said that ASPA has been working since a least as far back as 2016 to identify a partner in the planned project.